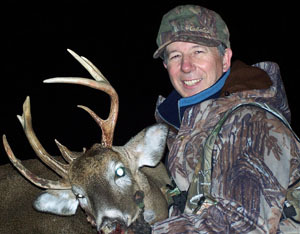 I have been deer hunting (with a gun) for a long time and have gotten my share of bucks and does. After my dad passed away in 2005 I decided to give bow hunting a try since I inherited his old Browning compound. That first year I practiced all summer and had a couple of shots at nice bucks, but missed them both. I think they both jumped the string as his old bow was pretty loud. The next year I upgraded to a new Mission (made by Matthews). Again, I got a shot at a really nice buck but missed - this time it was user error! I did finally score on a nice doe. After 2 seasons of bow hunting I was hooked, don't know why I hadn't started years ago. I got serious about trying to get a nice buck, I put in some clover and also a plot of corn and soybeans. This year ,which is my 3rd season with a bow, I got another shot at a nice size 8 point at about 15 yards, but shot right over his back. I was getting a little discouraged thinking that I just couldn't keep my cool. The next evening I decided to try a stand I had set up near a trail leading to my corn and soybeans. Just about quitting time I see a deer making his way through the woods at about 50 yards. He turns and comes right down the trail toward the corn. I can see that he is a pretty good size deer and I know he is buck. I can't make out the rack yet as he has his head down and is walking pretty fast. I am determined this time to keep my cool. I know if he stays on the trail he will come broadside at about 13 yards. I draw and wait for him to get into my shooting lane. He steps right in and I line up perfectly on his chest and let one fly. I see the arrow hit and I know it is a good shot. He jumps and runs out into the field for about 75 yards then stops and drops. He is done but I wait about 20 minutes just watching to make sure. By now it is pretty dark so I go get the 4-wheeler so I have some light to field dress him. He is laying on his right side when I get up to him his left side is a nice typical 4 points but when I look at the right side, man, he has some strange narly looking rack. Not sure how many points he would be but very unique to say the least! I am hooked on bow hunting and can't wait for next year!